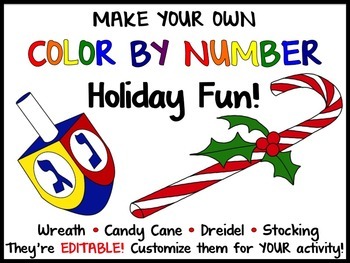 Make your own Color By Number activities with this set of pictures. You’ll receive four simple black line holiday images. Every image is pre-numbered with EDITABLE text boxes so that you can customize the activity for YOUR subject, grade level, or differentiated tasks. You will also receive the plain black line images without text boxes so that you can resize the images if you need to before adding your own text boxes. If you need a few more sections for the task you have in mind, feel free to add sections using the shapes or drawing tools in PowerPoint. In short, you can customize these pictures to EXACTLY suit your individual needs no matter what grade or subject you teach. You may use the images in this product to create your own color-by-number lessons for personal use in a homeschool setting, or educational use for one teacher’s class or classes. You may use these images within or as part of a product for sale on Teachers Pay Teachers, so long as that product includes materials created by you for student use, and is not merely a collection of images for a coloring book. If you are interested in using these images in products intended for sale other than on Teachers Pay Teachers, please contact me for terms by leaving a message in the Q/A section of my store. Any product made for sale, which includes these images must include a link to my store.